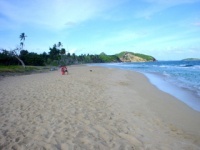 There are about 45 Grenada Beaches to choose from. Yes, you heard me right: 45 Grenada Beaches. Well … that sounds great, but to be honest it’s more beach than you, and I have the time, or energy to handle. Okay so let’s cut it down from 45 Grenada Beaches to the top 6 Grenada Beaches. We’re not throwing the other 39 beaches away, only putting them on reserve for you. If you ever get the urge to explore further, they’re all your’s for your enjoyment. You will be hard pressed to find a more spectacular beach anywhere in the world, no kidding … and am not biased, that’s according to the many travel writers and visitors that swim, stroll, and soak up the sun, on this beach each and every year. Most locals refer to this one as BBC beach, am sure there is a story behind the name but I never bothered to inquire. Probably got the name from the BBC night club that once operated on the beach. 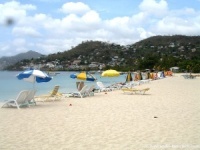 Morne Rouge Beach like Grand Anse beach lies in the heart of the hotel district, in the south of Grenada. Holidays aside, this is one beach you can have all to yourself. It’s an interesting contrast of Lush green trees, white sands, and calm turquoise waters. When am looking for a more peaceful relaxing day I will choose Morne Rouge on a weekday. 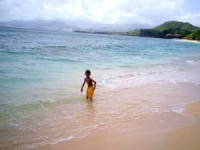 And if you have small children, then this beach is probably one of your safest choices among all the Grenada Beaches. Morne Rouge Bay is sheltered, so the waves are often quite calm. Another beautiful beach on Grenada’s Southwestern coast. Magazine Beach, is is the home of the Rex Grenadian Hotel and the Aquarium Restaurant. The beach is about one mile of white sand, and clear blue waters. Great food and drinks from Aquarium Restaurant, kayaking, and snorkeling all accentuate a fun day on this Grenada beach. Find out why Sunday is one of the best days to spend on this beach. This one lies almost at the very tip of the island, behind the hill overlooking Point Salines International Airport. Pink Gin Beach, is even more secluded than Morne Rouge Beach. Pinkish sand, pristine waters and a picturesque view of St. George welcomes you at Pink Gin Beach. Add to that, the convenience of the La Source Hotel, the opportunity for all sorts of water sports; or just chill out and relax; and it’s easy to see why Pink Gin Beach is a top favorite. 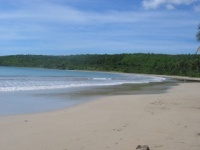 A beautiful strip of white sand beach in the north of the island. If you are looking for action … people, food, drinks, and just good times then Bathway beach on a Grenada holiday is the one place to be. When you’re at Bathway you get a bonus!! Only a couple minutes away is another one of Grenada’s very special spots. Any list of the top Grenada Beaches won’t be complete withoutan option for the romantic birds. If you want quiet time with that special someone, then La Sagesse can be your beach. Most people come here when they do not want to be seen, or disturbed. What’s Your Favorite Grenada Beach? 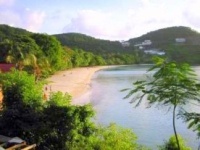 Don’t like my favorite Grenada Beaches? Or maybe you like them for another special (secret) reason? No problemo!… Just use the form below to share YOUR favorite Grenada Beach. Grand Anse Beach is Stunning! Gooch, we will be visiting Grenada for only one day arriving by cruise ship. Is there a nice beach close to the cruise ports. Is there transportation available. I would like to go to the best beach if not too far away.